Atenas v Granada, Španělsko: Zarezervujte nyní! Our establishment is an anniversary, this year we turn 50 years of experience in the Hotel industry in Granada, the continuous renovation and modernization has allowed us to maintain our facilities and services at the height of a Hotel in Granada of between 1 and 2 stars. We are a family business with vocation, training and long career, so we know that the most important thing is that the client, even when staying in a hostel, expects your trip to be special, memorable and comfortable. 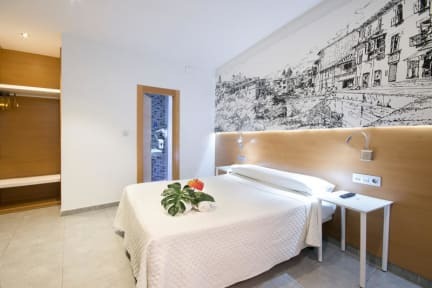 Located in the center of the city next to the Cathedral of Granada and adjacent to the famous Albaicín district, shopping, entertainment and tapas, very close to the Alhambra and Generalife with great public transport connections or if you want taking a stroll 15 minutes. The unbeatable location of the establishment will allow you to visit the entire city on foot. All our rooms have private bathroom, air conditioning, heating, television and free WI-FI.